The Empire is located at 424 N Broadway and is one of downtown Fargo’s staples. The Empire is the epitome of a tavern with its low lighting, friendly staff, colorful crowd and stiff drinks. It features both happy hour and daily drink specials, has an attached liquor store, and if you’re feeling munchy, Pizza Corner pizzas and chips are available. Though the Empire is undergoing a bit of a change, they are opting for more craft beer selections such as Drekker, Kona, Schell’s, Fargo Brewing Company, Sierra Nevada and Fulton’s Lonely Blonde. The Empire once had nine draft lines but is now upping the ante to 16. The Mandarin Mule contains Hangar 1 Mandarin, Gosling’s ginger beer, a splash of orange juice and then garnished with both a lime and orange slice. 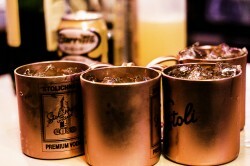 According to Tjon, the inspiration behind this cocktail was the popularity of the Moscow Mule within the past few months. He enjoys the simplicity of this drink. “We’re big on shots, so we wanted to get out of the box a bit.” The Mandarin Mule is served in a copper cup, which helps the drink stay chilled longer and creates a shaker effect bringing out the cocktails flavors and aromas. 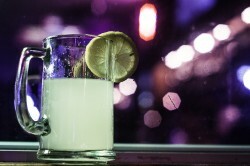 The Adult Lemonade contains Absolut Citron, Stoli Citrus, lemon juice, sugar, lemonade and sugared lemon as garnish, and it is served in a frosted mug. Basol wanted to create a light, refreshing, summertime drink; it’s listed as a shot but if served on ice can be enjoyed as a drink. Located at 1550 32nd St. S in Fargo, Woody’s has a full kitchen (the menu includes burgers and fry baskets, appetizers, soups, salads and even has a bison burger special during Bison games) and features weekly lunch specials and daily drink specials. 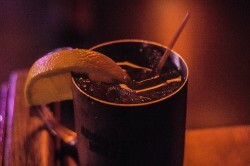 The Woody’s Mule contains Barritt’s ginger beer, Deep Eddy sweet tea, Jameson and orange juice. According to Wall, Woody’s does not have a drink menu per se, though he says their best sellers are primarily Windsors, tall beers, bomb shots and teas. The Great Pumpkin is a drop shot, meaning a shot of liquor is dropped into a larger cup containing another liquid. It contains Fireball and Rumchata dropped into Leinenkugel’s Harvest Patch Shandy. Woody’s has a liquor store attached to it, so Wall had a lot to choose from. Drop shots are quite popular at Woody’s and the staff is accustomed to serving a high volume demographic, meaning lots of plastic and nothing too terribly fancy. Good call on the plastic as far as a drop shot goes, many teeth will be spared with just one squeeze of the cup. The Cork ’n Cleaver is located at 3301 S University. The Cork ’n Cleaver has been serving the area since 1970 and carries on a southwestern theme. Known primarily for their steaks, seafood and pasta, they have a great bar menu with a Louisiana flavor and lavosh for those vegetarians out there. Let us not forget their desserts and a killer martini menu. Plus martinis are $1 off on Mondays. Just one S’more contains a housemade Irish creme liqueur, Godiva dark chocolate liqueur, coffee and is rimmed with a marshmallow creme. Dahl started with a Bacardi 151 rinse in which he roasted a marshmallow on site. 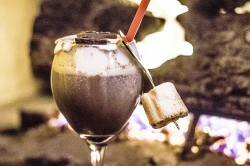 He then continued to mix the other ingredients, and then topped the cocktail with whipped cream and a smoked sea salt, creating a sweet salty, creamy chocolatey concoction garnished with a toasted marshmallow. “The Thriller” starts with a pop rock rim, it contains Lucid Absinthe poured over more pop rocks, topped off with a little bit of club soda. 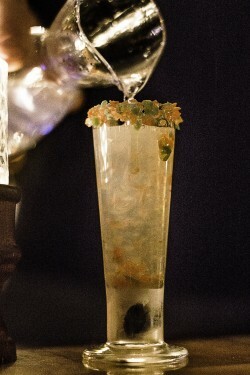 “The Thriller” is Dahl’s take on the traditional way of serving absinthe, which is with water and a sugar cube. Not only is it visually compelling with the color of the pop rocks it’s an auditory sensation--meaning it’s all thriller no filler.